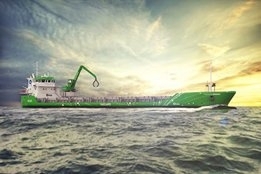 An impression of how the ‘Hagland Captain’ will look after its retrofit work. Image Credit: Hagland Shipping AS. Wärtsilä says it has signed a deal with Hagland Shipping AS for a hybrid retrofit it says is the first project of its kind in short-sea shipping applications. The installation of a battery hybrid propulsion system on the 4,700 dwt general cargo vessel Hagland Captain combines engines, an energy storage system using batteries, and power electronics along with a newly developed energy management system (EMS). At present technology levels, powering larger vessels using 100% battery power is only possible for very short periods, and the conversion will see the vessel fitted with a battery capacity providing approximately 30 minutes of propulsion. This is designed to be sufficient for it to sail in and out of harbour on electric power, reducing emissions and noise in the process. A shore power connection will allow for at-berth powering of ship systems and charging of the battery, all without producing any vessel-based emissions. Overall, fuel cost savings in the range of 5 to 10% are expected. "Environmental considerations are increasingly important for fleet owners around the world," said Paul Kohle, Director, Sales & Sales Support, Asset Management Services, Wärtsilä Marine. "The need for the latest smart marine technologies has been seen for some time already in deep sea shipping, and this project is evidence that the need also exists in short-sea transportation."